This page addresses some steps women could take to make themselves more physically attractive, which, although not the focus of this website, is nevertheless provided so as to not disappoint women looking for such information. The topics addressed on this page involve primarily non-drastic measures, i.e., measures not involving prescription drugs, surgery, injections or gene therapy. The issues discussed are losing excess body fat, gaining muscle mass where necessary for acquiring a proportionate physique and some skin care issues. Please note that what follows does not constitute medical advice, and it is your responsibility to seek medical clearance prior to embarking on dietary modification or an exercise program. The basic idea behind non-surgical excess body fat loss is to use the excess body fat to supply the body’s energy requirements. This can be achieved by reducing food intake, increasing physical activity or both. Let us address basic energetics to appreciate which strategy is best. A calorie is a unit of energy. 1000 calories = 1 kilocalorie = 1 Calorie (note the capital C). Caloric information listed on food labels refers to kilocalories (Calories), not calories. It is also useful to understand METS; MET stands for metabolic equivalent. 1 MET is defined as the energy expenditure per unit body weight per unit time while resting. Therefore, physical activity rated at 3 METS implies energy expenditure that is 3 times the resting energy expenditure, physical activity rated at 5 METS implies energy expenditure that is 5 times the resting energy expenditure, and so on. Table 1 below lists the MET ratings of various physical activities. Table 1: MET ratings of various physical activities. Table 1 can be used to determine energy expenditure during various physical activities using the following formula. Those who know their body weight in kilograms should multiply it with 2.2046 to get their body weight in pounds. Let us determine the energy expenditure of a 200-pound woman engaging in leisurely swimming (MET value = 6) for one hour, i.e., 60 minutes. Plugging the numbers into the equation above reveals an energy expenditure of 546 Calories. Now, consider the energy content of some food items in Table 2. Table 2: Energy content of some food items. Therefore, the 546 Calories spent during an hour of exercise by the 200-pound woman in our example above can be easily compensated for by a simple meal. Assume that the 200-pound woman in our example above is mostly sedentary but starts spending 546 extra Calories per day exercising and does not increase food intake, i.e., her body ultimately taps the extra energy expenditure from her body fat stores. Burning 1 gram of fat provides 9.2 Calories of energy, i.e., if 546 Calories are ultimately obtained from utilizing body fat stores, then about 59 grams of fat have been removed from the body fat stores. If this woman removes fat from her body fat stores -- without replacing it -- at a rate of 59 grams per day, then it will take her 7.7 days to lose one pound of body fat or 77 days to lose ten pounds of body fat (1 pound = 454 grams). Therefore, relying on exercise alone to lose excess body fat produces slow results. Of course, the woman could exercise more to expedite weight loss. Let us say that she wants to lose 5 pounds of body fat per week by increasing her energy expenditure and having her body ultimately derive the energy from her fat stores. The energy contained in 5 pounds of fat, i.e., 2,270 grams of fat equals 2,270 x 9.2 Calories or 20,884 Calories. 20,884 Calories derived from body fat per week equals 2,983 Calories ultimately derived from body fat per day to compensate for the 2,983 Calories spent in exercising per day. Exercising at 6 METS, it would take about five and a half hours of exercise per day for this woman to lose 5 pounds of body fat per week. In other words, exercise alone is an impractical way for losing lots of excess body fat within a short amount of time. To expedite body fat loss, one has to resort to reducing food intake, i.e., dieting. Firstly, a sharp reduction in food intake should not exceed more than a few weeks. Micronutrients such as vitamins and minerals are present in miniscule amounts in food, and if one were to go on a severe diet, it would be highly advisable to take a multivitamin/multimineral supplement every day. Such supplements are very cheap, and one need not exceed 100% of RDA (Recommended Dietary Allowance) for each of these nutrients. Multivitamin/multimineral supplements should preferably be taken with meals, especially meals that have some fat content because most vitamins are fat soluble but not water soluble. Fats are split into fatty acids and glycerol after digestion, both of which can be oxidized for energy. Fatty acids are also required for various syntheses. Two fatty acids -- linoleic (oleate) and linolenic (olenate) acid -- are essential, i.e., are not synthesized by the body. One may consider supplementing oneself with these two essential fatty acids while severely dieting. Proteins are made up of amino acids, about half of which our body can make and the other half needs to come from the diet. Therefore, it is advisable to take an egg-white or whey-protein supplement while severely dieting. Such supplements are economical if purchased in bulk. Adults on average need around 50 grams of protein a day. 50 grams of protein provides about 200 Calories (kilocalories), i.e., protein supplementation won’t interfere with dieting. Since fiber tends to leech minerals, it is best to take fiber and multivitamin/multimineral supplements at separate meals. A drastic -- though not recommended -- way of quickly losing lots of body fat is to employ a trick from starvation physiology. When someone starves, the body resorts to extreme measures to prolong survival. Normally, some proportions of fatty acids (a product of fat breakdown) are converted to ketone bodies, which can be burned for energy or utilized for other purposes. In starvation mode, large proportions of fatty acids are converted to ketone bodies, some portion of which is burned for energy and the rest exhaled, i.e., one quickly loses body fat because one doesn’t have to burn all of it. This is the bright idea behind very-low-carbohydrate diets such as the strict Atkins diet; the body is forced to switch to starvation mode because of the low carbohydrate content of the diet. Not all low-carbohydrate foods or diets are equivalent; for a low-carbohydrate diet to work, one shouldn’t consume more than 60 grams of carbohydrates a day. Needless to add, one hardly needs to warn people about possible negative long-term consequences of sticking to a genuinely low-carbohydrate diet because it is unlikely that one could stick to such a diet for long. Food items that taste great are often rich in calories, but this doesn’t mean that motivated individuals cannot prepare tasty low-calorie food. In 1998, the U.S. National Institutes of Health released a report on obesity, and part of this report included good information on selecting/preparing low-calorie food items. Some people resort to specific exercises to target excess body fat in particular spots such as the abdominal region. However, it is not the case that subcutaneous (below the skin) or visceral fat in the abdominal region will be specifically targeted for mobilization as a fuel source by exercising the abdominal muscles. If there is a need for mobilization of stored fat, it will be mobilized from fat stores, including the abdominal region. Rigorously exercising the abdominal muscles does not spend much energy; one is better off exercising larger muscles such as the muscles of the legs and buttocks. Nevertheless, people who insist on submitting their abdominal muscles to a grueling workout can take some precautions to reduce injury. Consider Fig 1, which shows the hip flexor muscles and two forms of exercise (hip flexion) that are often assumed to exercise the abdominal muscles but mainly target the hip flexors, instead. Obviously, the spine is pulled during hip flexion and this can create problems. 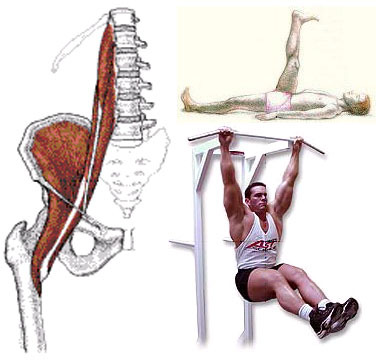 Hip flexion in the form of raising one leg at a time while lying on one’s back is less risky than hip flexion involving raising both legs simultaneously while either lying down or hanging from a bar or while using the arms and shoulders to support one’s body weight (forearms resting on parallel bars). Fig 1: The hip flexors and two examples of hip flexion. Although there are some benefits to strengthening the hip flexors, most people had best avoid hip flexion involving raising both legs simultaneously, especially people with abdominal obesity, lower-back pain or a history of lower-back pain. It should also be noted that full sit-ups mainly involve the hip flexors for a large portion of the range of movement. Hence, abdominal crunches rather than full sit-ups are recommended, wherein the knees are bent, the lower back remains in contact with the ground throughout the movement and the hands are resting on the chest (Fig 2). Also, when performing calisthenics (systematic rhythmic bodily exercises performed usually without apparatus), avoid movements that twist your lower back in jerks. 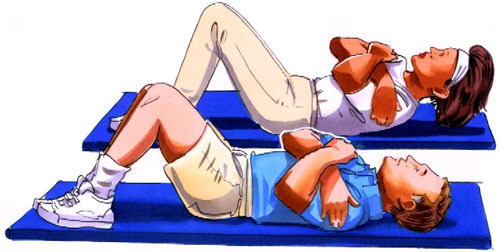 Fig 2: Illustration of abdominal crunches. Picture taken from Sportsmed. Some discussion of cellulite is also relevant here. Cellulite refers to deposits of dimpled fat found on the thighs and buttocks of many women (and some men, too), including non-obese or even skinny women. Excess body fat will make the appearance of cellulite worse, but getting rid of excess body fat is hardly a cure for cellulite since the problem also involves connective tissue, i.e., extensively exercising the leg and hip muscles is not going to get rid of cellulite. See the zipped compilation of articles on cellulite toward the bottom of this page to learn more about cellulite and its treatment. Some very skinny women would aesthetically benefit from gaining muscle mass overall. Regular exercise will help in this regard. Those unwilling to exercise may achieve a small but noticeable increase in overall muscle mass by supplementing with creatine monohydrate, a fuel. Increasing the amount of creatine in muscles increases the amount of water stored in the muscles, thereby making them larger. (1) Creatine is generally considered a safe supplement; there have been isolated reports of muscle/stomach cramps, dehydration or irregular heart beats as a result of regular creatine supplementation but no long-term harm after years of regular use has been reported so far. (2) Creatine supplementation should be avoided by people with kidney diseases or pregnant/lactating women and people on medication or those suffering from ailments should consult a physician prior to supplementing with creatine. Creatine monohydrate is best taken in the form of a drink mix where it is mixed with a sugar such as dextrose (6 parts of sugar per part of creatine monohydrate); one usually takes 20 grams of creatine monohydrate per day for the first 5 days of supplementation, followed by 5 grams per day to maintain elevated creatine levels in muscles. In some cases, the problem of gaining muscle mass to improve physique proportions is complex, an example of which is shown in Figures 3 and 4 (all photos are of the same woman), wherein the lower legs of the woman are out of proportion with her thighs and backside. For aesthetic reasons, this woman had better not add more mass to her buttocks and thighs, but she needs to add muscle mass to her lower legs. Unfortunately [from an aesthetic standpoint] for this woman, some of her lower leg muscles, the gastrocnemius and soleus in particular (Fig 5), have short muscle bellies and long tendons (tendons attach muscles to bones or other sites of attachments), i.e., no matter how much she develops her lower leg muscles, the lower part of her lower legs will normally remain much skinnier [from an aesthetic standpoint] than the upper part of her lower legs unless the muscle structure were changed. In animal experimentation, short muscle bellies can be lengthened by subjecting them to chronic stretching, something that is not feasible for the woman in this case. Surgery could be used to lengthen the muscle bellies of the gastrocnemius and soleus muscles in her case, but I haven’t heard of someone resorting to such an extreme measure for aesthetic reasons; the measure being extreme in terms of the costs involved, pain and weeks-long immobilization of the legs. Fig 3. Pictures taken from FTV girls (adult site). Fig 4. Pictures taken from FTV girls (adult site). Fig 5: A model of the left lower leg shown from behind (source). The soleus lies beneath the gastrocnemius and runs the length of the lower leg. Even though there is no easy way for the woman shown in Figures 3 and 4 to increase the length of the muscle bellies of the gastrocnemius and soleus, she can aesthetically benefit from adding some mass to these muscles. 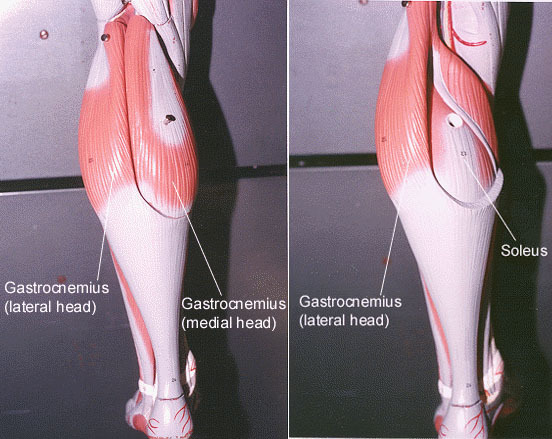 The gastrocnemius and soleus are especially involved in the act of raising oneself on the balls of the feet while standing and the soleus is also especially involved in the act of raising the lower legs on the balls of the feet while seated. The quickest way of adding muscle mass is to resort to eccentric training, which also corresponds to less cardiovascular demand while working out compared to other forms of resistance training. (3, 4) A muscle that shortens under load is contracting concentrically, whereas a muscle that lengthens under load is contracting eccentrically. Consider some examples of eccentric contractions. Imagine that you are doing pull-ups while hanging from an overhead bar, and at the topmost position, you let go of one hand. The typical person will not be able to remain at the topmost position in this case and will quickly descend, i.e., the front upper-arm muscles (biceps brachii, brachialis) of the hand holding onto the overhead bar will have lengthened under load (contracted eccentrically) in this case. Another example of an eccentric workout would be to equip a stationary bike with a motor that makes it spin counterclockwise (backwards) and then try to pedal the bike like one normally would, adjusting the resistance to one’s liking. Eccentric training requires some ingenuity, specialized equipment (e.g., here) or partner assistance. Readers interested in such training would do well to learn more about the musculoskeletal system to come up with safe workouts on their own or seek a gymnasium/personal trainer that is able to help one workout eccentrically. Those starting out with eccentric training should start with very light loads or they will experience severe delayed-onset muscle soreness (1 to 2 days following the initial workout), i.e., immobilizing pain. Muscles exercised in order to increase their size should be allowed at least two days of recovery between workouts and three or more days if one is involved in intense eccentric training. Refer to Table 3 for exercises that target specific limb muscles. Refer to the source of the data in Table 3 for detailed information on the exercises involved(5) or browse this directory for information on the muscles and exercises listed in Table 3. Table 3: Limb muscle involvement in some exercises. (5) Key: 2 = strong involvement, 1 = moderate involvement, blank = no significant involvement; neutral grip = midway between palm facing up and palm facing down. Key: ADB = Adductor brevis, ADL = Adductor longus, ADM = Adductor magnus, GR = Gracilis, SR = Sartorius, ST = Semitendinosus, BF = Biceps femoris, RF = Rectus femoris, VM = Vastus medialis, VL = Vastus lateralis, VI = Vastus intermedius. The following items link to pdf files or zipped articles on a number of looks-related issues of interest to some women. Powers, M. E., Arnold, B. L., Weltman, A. L., Perrin, D. H., Mistry, D., Kahler, D. M., Kraemer, W., and Volek, J., Creatine supplementation increases total body water without altering fluid distribution, J Athl Train, 38, 44 (2003). Bizzarini, E., and De Angelis, L., Is the use of oral creatine supplementation safe? J Sports Med Phys Fitness, 44, 411 (2004). Lindstedt, S. L., LaStayo, P. C., and Reich, T. E., When active muscles lengthen: properties and consequences of eccentric contractions, News Physiol Sci, 16, 256 (2001). LaStayo, P. C., Woolf, J. M., Lewek, M. D., Snyder-Mackler, L., Reich, T., and Lindstedt, S. L., Eccentric muscle contractions: their contribution to injury, prevention, rehabilitation, and sport, J Orthop Sports Phys Ther, 33, 557 (2003). Tesch, P. A., Target bodybuilding: precision lifting for more mass and greater definition, Human Kinetics Publishers, Champaign, IL (1998). Sketch by Dave Nestler (top left).